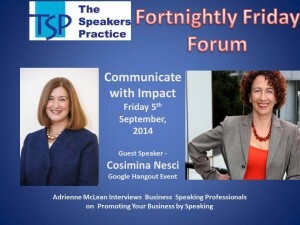 This is a fabulous discussion with Cosimina Nesci, Results Based, Image Specialist – speaking on Communicating with Impact – Cosimina discusses some values ideas in this 30mins interview. Julie Mac Donald, Julie Mac Practice gives some valuable approaches to reducing nervousness when delivering presentations. Very useful video for anyone who suffers from nerves when getting up and speaking in front of a group.